Our collection of nail shapes will help you find the perfect one. Nails have so many different shapes and it is super hard to make the decision. But we will show you how to do it. Changing your nail shape is a great way to modernize your mani. If you want to bring something different and unusual into it, it doesn’t mean you have to choose another shade of color. An experiment with a nail shape will totally fresh up your signature look. This is what, by the way, many nail experts advise to do. We provide the best nail shape chart to consult before you go to the nail salon. You will figure out the perfect shape that suits your personality and look. We have included the trendiest shapes right now, which are coffin nails, stiletto nails, and pointy nails. Spice things up with these shapes! Duck nails – what are they? In case you want to learn that – you have come to the right place! 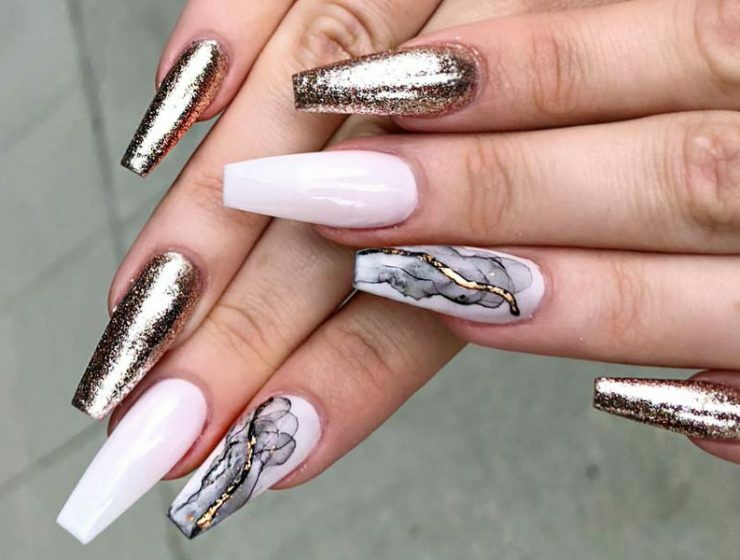 There are truly many nail shapes available out there, and it is time you learn about all of them with all the upsides and downsides! Are you ready? Pick the best nail shape to look irresistible no matter where you go or what you are busy with! It is true that there are so many long nails ideas that it may be difficult to choose the suitable one. However, we have all the trendiest suggestions gathered in one place! Black stiletto nails is not only the proof of style and class it is also a small masterpiece created on your nails. In case, you do not trust us – welcome to our trendy black nail art compilation! Simple nail designs for short nails are many, but we have gathered here only the most extraordinary ones!